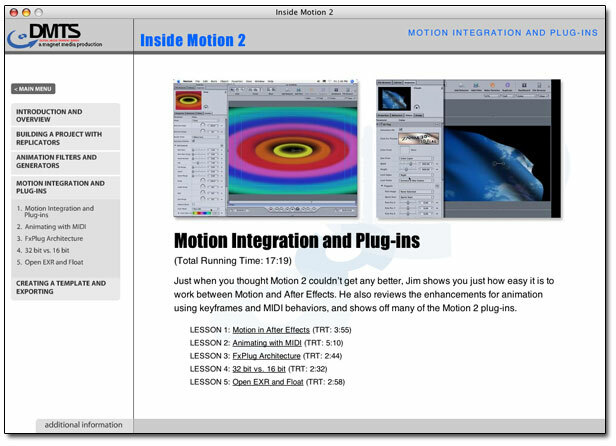 Digital Media Training has released Inside Motion 2. This new training DVD-ROM is an extension of the Motion 1 Training DVD, which I have reviewed already here. For new customers, the Motion 2 trainer includes the prior Motion 1 training in the package. So Motion 1 and 2 customers should simply purchase the Motion 2 training, which will give you both trainers and will allow you to upgrade your software, without having to upgrade your training. Inside Motion 1 is hosted by Megan Cunningham. However, this new updated DVD-ROM is hosted by Jim Kanter, who has impressive credentials and an obvious talent for teaching. His style not only expresses the basics common in any feature-by-feature overview, but in addition, he has genuine creative talent and uses it effectively in these lessons. Magnet Media as always supplies the user with both video-based lessons and training materials, giving you an instructor-led training course with both visual direction and hands-on experience. Just as with Inside Motion 1, you learn by watching and by doing. Because Inside Motion 1 has already been reviewed, I will focus solely on the updated DVD-ROM in this two-disc set. For a comprehensive review of the first DVD-ROM included in this two-disc set, please read Inside Motion. 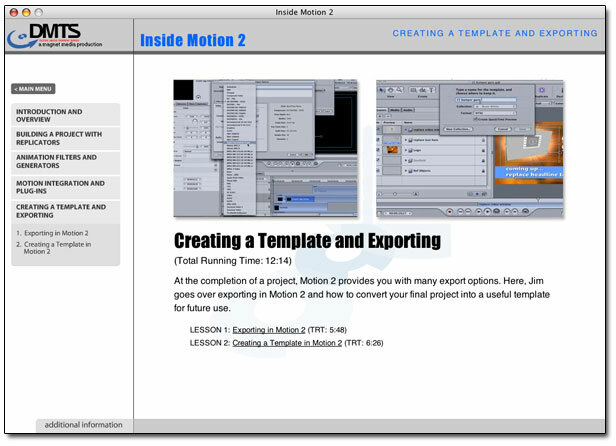 For new users of Motion who are just getting started with Motion, it is suggested you start with Inside Motion 1, included in this package. Once you have completed that training, begin the training provided in the second DVD-ROM. 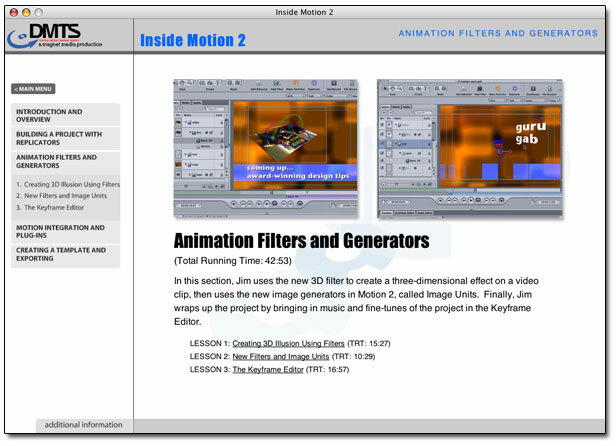 Disc two offers four main sections, which focus on building a project with Motion's Replicators, working with animation filters and generators, detailed examples of Motion integration and the use of plug-ins, and finishes with creating templates and exporting. Of specific interest to many is working with Motion and After Effects combined. There are new round-trip features that allow Motion users to easily drop Motion projects into After Effects as After Effects Compositions. This is a huge welcomed feature in that it offers round-tripping. If you are an After Effects user as I am, you may want to skip right to Motion Integration and Plug-ins to see this for yourself before watching the DVD-ROM in its logical order. Immediately as you begin watching the first section, you will see that Mr. Kanter has some pretty insightful methods of adjusting your layers to better organize and make use of your screen. Within the first two minutes, I paused and wrote myself a note to that effect. I'm always happy to gain a new tip when it concerns screen space, and organizing my layers, especially because Motion produces deep layers as it creates effects that make use of reference objects and emitters. In addition, new users will learn to see the very assets that affect playback speed: how to get rid of the items you don't need, and to improve performance. As you watch these seemingly simple aspects of working with Motion, you begin to realize just how flexible it is, and how easily you can modify the pre-packaged particles to suit your own needs. In fact, we see this again when working between Motion and After Effects later, and it's really one of the hallmarks of Motion. 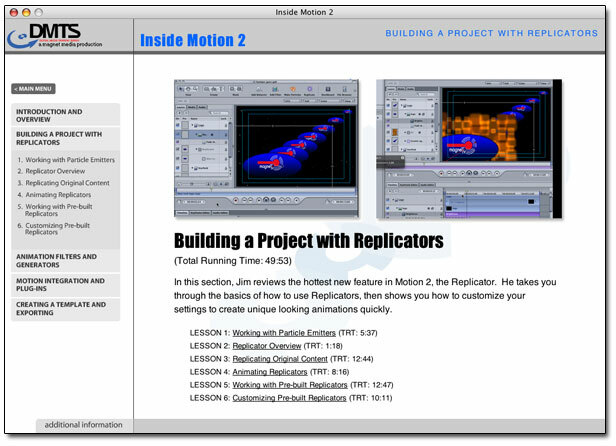 Particles of course are one of the features everyone raves about with Motion, and once you realize how powerful they are, you're ready to dive into a new feature of Motion 2 called Replicators. The replicator is a very impressive feature of Motion 2, and the instruction here really shows the potential. This section of course focuses on animating objects. You'll learn about the new control points you can add to a motion-path. In addition the 3D filter is quite impressive, giving Motion a simulated 3D space interactivity. All of this is key-frame capable, and the instruction again shows the potential quite well. The 3D filter also allows you to set a back to the back of, say, a video that has this filter applied. As you tumble a video in 3D space, the back of the video could be a backdrop of your choice, rather than the video itself in reverse. This is a nice touch, and learning how to do this will give your 3D space effects that much more of a professional look. There are new features here, such as extrude, that when combined with the 3D space filter can really jazz up the presentation of fonts without having to leave Motion for some other application, such as Boris FX. Animating the movement of such titles in the style of LiveType is also possible, sliding in each character of a word that has extrude and 3D space applied. The total effect is quite nice. Motion now offers round-tipping with Adobe After Effects. This is similar to how you work between integrated applications such as Motion and Final Cut Pro, and Motion and DVD Studio Pro. Now Motion goes beyond Apple and integrates with After Effects. As with Final Cut Pro and DVD Studio Pro, you can now take advantage of the Edit Original option inside After Effects to further change Motion compositions already imported into After Effects. There is an interesting lesson on adding key-frames automatically using the MIDI option in the behaviors property. Another new benefit in the area of plug-ins is Apple's new FX-Plug. This architecture gives third-party plug-in creators the ability to take advantage of Motion's real-time architecture. You can gain a little preview of what is to come from companies such as Zaxwerks. There is a great new feature overview of the Open EXR and 16 / 32 Float Color Space. This is only available to those users using fast processors and OS X 10.4. If you're going to start working with HD, or even film, you'll be quite interested to see this. To wrap up this excellent lesson, you learn to export, and create a template for future exports. There are a few options here everyone ought to be aware of, especially those who use alpha channels, or wish to use Apple's newer codecs. I can't see this as anything other than the great value it is. The lessons and their examples are much better than I had initially expected. I've outlined here in this review many of the sections I think are of particular note so that you have a good idea about what will be covered, and what it will mean to you as a Motion user. There are enough new features in this release of Motion that I encourage you to explore it much more deeply than you might have. The Open EXR developed by ILM alone will prove to be quite valuable to those professionals that need a 32-bit float color space. The lessons overall provide a valuable insight into the proper usage of all the new features you're about to be introduced into. Those users that are new to Motion will have the greatest value of all with this two-disc set, as they get both the original DVD-ROM and the new updated DVD-ROM. The updated DVD-ROM is not like other updates, in that most of the things you already know about Motion are not re-hashed. Instead they are left on disc one, and those new features you're interested in are all on disc two.